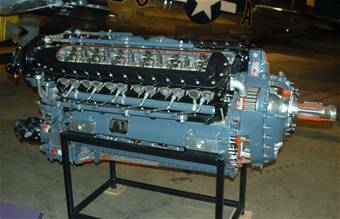 The Allison V-1710 was a liquid-cooled supercharged aircraft engine with 12 cylinders, a bore of 5.5 inches (140mm) and stroke of 6 inches (152mm) for a displacement of 1710 cubic inches (28.0 liters.) Each of the two banks of cylinders was a single light alloy casting. The coolant was pure ethylene glycol pumped at up to 300°F (150°C). The engine was designed from the start to use a turbosupercharger, but these were not available in sufficient numbers to equip any but the P-38 engine models. Development of the engine began in earnest around 1931, after Allison had been acquired by General Motors and was given an infusion of capital. By 1937 the engine was undergoing extensive flight testing, and it was adopted for the P-38 Lightning. Most models were produced in pairs, the second model number being a mirror image of the first, used to balance torque on multiple engine aircraft such as the Lightning. Aircraft using this engine included the P-38 Lightning, the P-39 Airacobra, the P-40 Warhawk, and early versions of the P-51 Mustang.